The ATOC Tandem Topper is quite simply the best roof bar mounted Tandem Bike Rack you can buy. 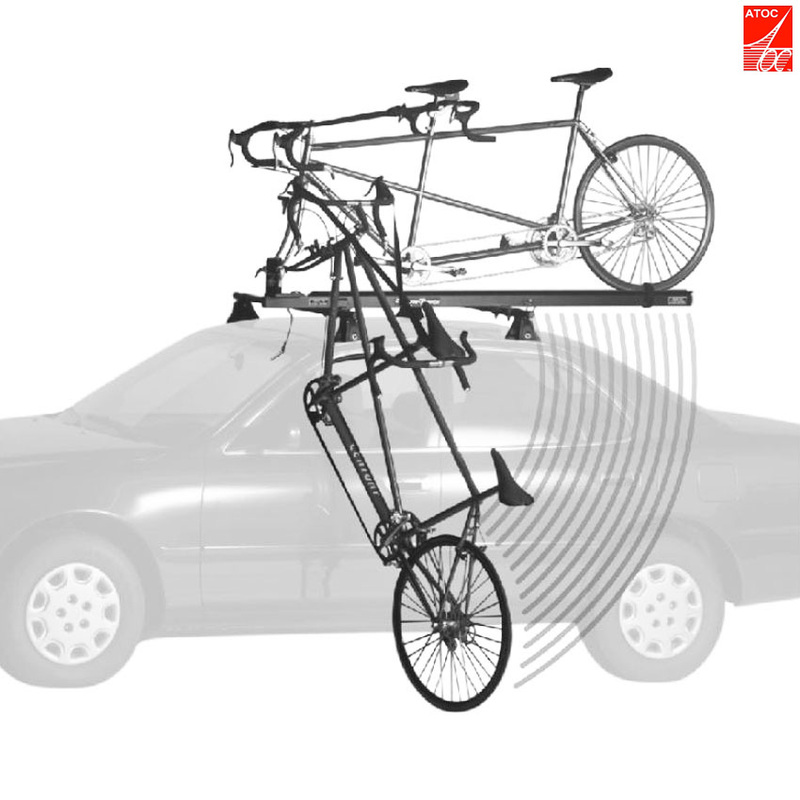 It's unique pivoting fork mount gives fast, simple, safe and secure mounting of your tandem on the roof of your car. This is easily achieved by one person with minimal effort. No straining, and no risk of damage to your tandem, yourself, or your car. If you've ever battled with a conventional rack on a windy day, you'll know exactly what we mean! Simply remove the front wheel, raise the forks up to the pivoting fork mounting skewer, secure the forks with the quick release skewer, pick up the back end of your tandem, lift and rotate it onto the rack. Strap down the rear wheel. It couldn't be simpler! Your tandem is fixed safely and securely to your car. The Tandem Topper is suitable for small cars with short rooflines - only requiring 56cm between roofbars, and as the rail can be easily separated, will easily store in the boot. The ATOC Tandem Topper is designed and manufactured in the USA from a bespoke powder coated aluminium extrusion, to give high strength, low weight, perfect funtionality, and good looks. Each part being specifically engineered for its intended use. - Maximum Wheel Base: 76"
- Minimum Load Bar Spacing: 22"
Hi, does it fit with thru axle or only quick release ? Thanks you. These are set for QR, you may be able to modify to run a through axle but we have no experience of this. Could this be used with a 2 wheel Babboe city cargo bike? And what is the weight limit? Unfortunately as we have never stocked that bike we would have no idea whether it would fit or not im afraid, and unfortunately we do not have a weight limit specified. Our tyre width is 2.8”. Can the gutters take this? Unfortunately this width of tyre would be too big to fit im afraid. Is attachment at only 2 base points: front fork/rear wheel? Most (vertical) racks seem to offer some support higher up, such as a clamp onto a frame tube. A tandem is bulky & I'd be concerned about side gusts of wind, if it's secured only at the very bottom (i.e. front axle & base of rear wheel). Even a sharp turn would put a lot of stress on the fastenings). The rack fixes to the lower of the rear wheel and the front axle dropouts. Is this rack suitable to use with a Hase Pino tandem. Here is a link to take you to the Hase Pino website. Hopefully this will give you enough information to provide a recommendation about its suitability for the rack. This should work with little trouble, just remove the front wheel and you can mount the bicycle to the rack. Can Tandem Bike With Wheelbase 76,8 Inches Fit Tandem Topper Tt-076? My tandem bike is a little bit longer (76,8 inches) than a manual of Tandem Topper TT-076 allows to carry. Is it possible, that the bike fits the topper? I don't see longer version TT-084 in your e-shop. As the wheelbase of your tandem exceeds the recommended maximum length we would not recommend fitting it to this carrier. We do stock the longer version that although listed for triplet bikes would be suitable for use with tandems with a longer wheelbase. These are SJSC part number 34497. I spoke to you yesterday about this and have now ascertained that the wing bars have a T track system. The specifications say that this rack can be mounted on round or Thule rectangular bars but I had the impression that it could be adapted to mount on T tracks. Can you confirm this before I order. We have not heard of anybody adapting these to fit on T tracks, nor is it mentioned anywhere in the instructions. This does not mean its not possible, it just means we have not seen it done so we can't say for sure if it will work or not.